You’ve seen the strained look on their face. They are far away, don’t sleep well and are withdrawing from activities. You’ve invited him/her to do the things they love doing, but it doesn't work. Their mood is off- balance and sometimes they overreact, but when you ask "what’s wrong," they deny having any problems. You’re happy he/she is back from combat, and you wish things would get back to normal. You thought that having him/her home safe would make both of you happy again. Your loved one may have post-traumatic stress disorder (PTSD). Many veterans suffer from PTSD. The Veterans Administration (VA) reports that as many as 11-20% of veterans of the Iraq and Afghanistan wars have it. Common war traumas include having been shot at, having seen someone shot or having seen death, but another cause of PTSD in veterans is military sexual trauma (MST). According to the VA, 23% of women in the military report sexual assault. These numbers are scary but the good news is that there is help. PTSD is a physiological disorder that can result from being exposed to a traumatic event. The disorder results in several different symptoms. • Re-experiencing. 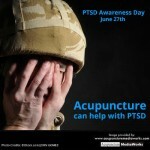 Some PTSD sufferers relive the traumatic event over and over. This can be in the form of bad memories, nightmares and flashbacks. Sights, sounds and smells can trigger re-experiencing the event. • Avoidance. Sometimes people with PTSD avoid the people, places and events that remind them of what happened. • Numbing. Symptoms of numbing include trouble expressing emotions, loss of interest in enjoyable activities, and the loss of memory of parts of the traumatic event. • Arousal. Anger, irritability, trouble sleeping, trouble concentrating, feeling on guard and being easily startled or surprised are common arousal symptoms. The effects of post-traumatic stress disorder in someone’s life can be far-reaching. Feelings of hopelessness, shame and despair, problems at work or with relationships, serious health problems, depression, anxiety and drug or alcohol abuse are not uncommon. How Can You Help your Friend or Relative with PTSD? There are many ways you can help your friend or relative with PTSD. • Learn everything you can about PTSD so you have a good idea what they are going through. • Offer to go to doctor visits with them. Help keep track of medications and therapy. If they are learning new techniques to cope with stress, ask if there is any way you can help. • Be available to listen, but be understanding if they don’t want to talk. Listen with an open heart. Don’t judge, argue or problem-solve. Listen with compassion. • Plan fun activities but be aware of events or environments that might be difficult and plan events to be as stress-free as possible. • Encourage them to get support from family and old friends. • Pay attention to any comments about hurting themselves and seek help from a therapist or doctor. Sometimes supporting someone with PTSD is challenging. Get support for yourself so you are able to help your loved one. Seek safety and help immediately if they become violent or threatening. • Go to your nearest Emergency Room. • Call the National Suicide Prevention Lifeline: 1-800-273-TALK (1-800-273-8255). Press “1” if you are a veteran. • Call the National Suicide Prevention Lifeline in Spanish/Español 1-888-628-9454. • Go to the Veterans Crisis Line website to chat live with a crisis counselor at any time of day or night. There are many new treatments available for soldiers and veterans suffering PTSD. The Veterans Administration has information about some of the therapies that have been most effective. MSRP has its roots in helping hurricane victims. In 2005, Diana Fried organized Acupuncturists Without Borders (AWB) to bring free community acupuncture to victims of Hurricanes Katrina and Rita. With the success of this program, Diana decided to use the same techniques to bring trauma relief services to veterans. MSRP and the program has since expanded to 27 different clinics. Treatment in a MSRP clinic is unique for several reasons. Patients are treated in a group setting, sitting in comfortable chairs. There is an environment of calm and support. And the patients are treated using the National Acupuncture Detoxification Association (NADA) protocol, a series of 5 needles placed in one ear. The program is designed to address all the needs of people with PTSD. Of course, if your loved one doesn’t have a MSRP clinic nearby, or if he or he prefers a private environment, you can contact me for an appointment. I offer a discount to military without insurance coverage. NADA treatments for PTSD are given once a week for 10 weeks. Call (864) 516-6868. What Can You Do to Help Veterans with PTSD? If you know someone with PTSD, reach out to them and offer support. And if you want to help even more, donate money or volunteer at community services for veterans. Many programs offer free services for veterans and they can always use assistance. Thank you to the soldiers and veterans who have served our country so bravely.